Formula VM-2000® Tablets is an high potency multivitamin with chelated minerals. 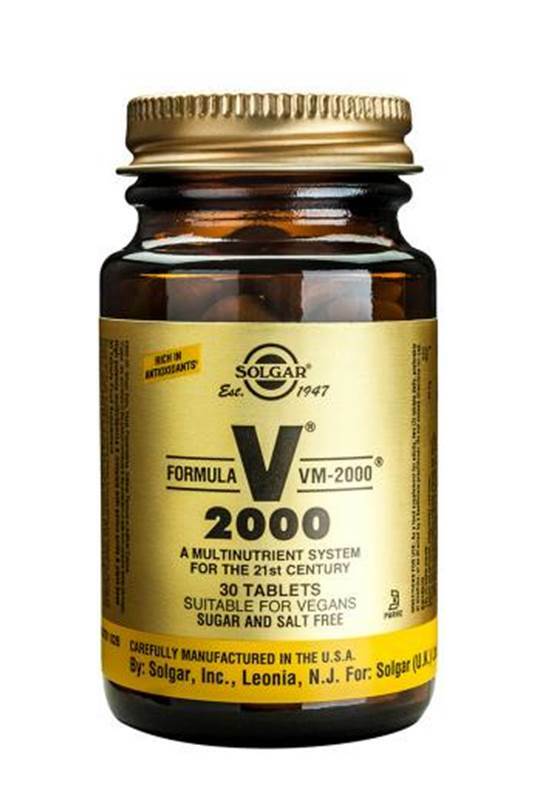 For adults, two (2) tablets of Solgar VM2000 daily, preferably at mealtime, or as directed by a healthcare practitioner. Do not exceed directions for use. This product contains vitamin A. Do not take if you are pregnant or likely to become pregnant except on the advice of a doctor or anti-natal clinic. +Special multi-chelate formula providing minerals complexed as amino acid chelates, citrates, aspartates, picolinates and highly absorbable mineral forms from Albion Process Patent #4,599,152 chelazomes. ++Unique form of chelated iron (iron bisglycinate) formulated for maximum absorption without the gastrointestinal irritation or constipating effects that often accompany iron supplementation. Albion Process Patent No. 4,599,152 Chelazomes.